Until few years ago non-specific cytotoxic agents were considered the tip of the arrow as first line treatment for lung cancer. However; age > 75 was considered a major drawback for this kind of therapy. Few exceptions were made by doctors based on the performance status of the patient. The side effects of these agents are still severe for several patients. In the recent years further investigation of the cancer genome has led to targeted therapies. There have been numerous publications regarding novel agents such as; erlotinib, gefitinib and afatinib. In specific populations these agents have demonstrated higher efficiency and this observation is explained by the overexpression of the EGFR pathway in these populations. We suggest that TKIs should administered in the elderly, and with the word elderly we propose the age of 75. The treating medical doctor has to evaluate the performance status of a patient and decide the best treatment in several cases indifferent of the age. TKIs in most studies presented safety and efficiency and of course dose modification should be made when necessary. Comorbidities should be considered in any case especially in this group of patients and the treating physician should act accordingly. Lung cancer is considered the second most frequent cancer for men after prostate cancer and breast cancer for women. Non-specific cytotoxic agents are currently used for the treatment of non-small cell lung cancer (NSCLC) and small cell lung cancer (SCLC). [2-4] However; side effects are the reason for some patients to postpone their treatment and in some cases to be hospitalized increasing the cost of treatment. In the recent years targeted therapies have emerged and based on the genome of cancer specific oral agents are being administered. 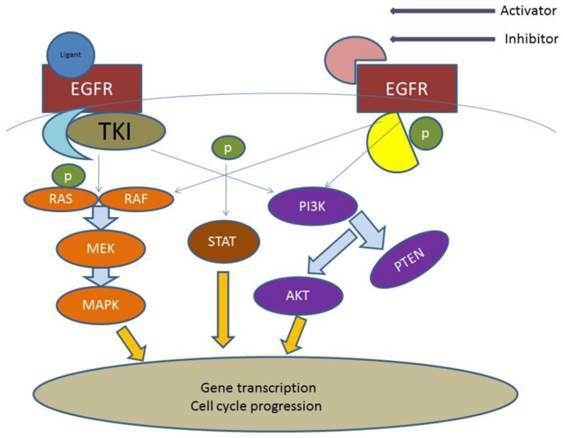 Epidermal growth factor receptor status and anaplastic lymphoma kinase status are the two most investigated pathways regarding adenocarcinoma. [6-8] Erlotinib, gefinitib, afatinib and crizotinib are the most frequently used targeted agents. [7, 9] Erlotinib, gefinitib and afatinib have presented superiority in terms of overall survival and disease control when compared to doublet chemotherapy agents in a specific group of patients. However; resistance to tyrosine kinase inhibitors has been observed and therefore new or alternative treatment approaches are being investigated. These agents are considered safer in the sense that the patients have less side effects, however; they still have side effects which in some cases are dose dependent and directly compared with the positive disease control. Regarding SCLC chemotherapy is still the considered the best first line treatment, however; several novel therapies are being investigated. [13-16] The role of tyrosine kinase inhibitors as neo-adjuvant or adjuvant treatment is still under investigation. One observation has to be taken into serious consideration that if chemotherapy is administered in EGFR positive patients as neo-adjuvant treatment then the mutation status will change along with the gene status of several other involved pathways with an unknown treatment effect in the future if treatment will become necessary (disease relapse). In the study by Spaans JN et al. it is suggested that there are no clear evidence that a patient should receive neo-adjuvant tyrosine kinase inhibitors for early stage NSCLC, however; there are evidence that patients will benefit from this oral drug administration. In the case presented by Funakoshi Y et al. a patient received gefinitib as neo-adjuvant treatment, downstaging of the disease was observed and the patient underwent pneumonectomy. In the study by Li N et al. it is suggested that as adjuvant treatment gefinitib can be administered with or without other chemotherapy agents. In the editorial by Martinez P et al. it is suggested that tyrosine kinase inhibitors could be used as adjuvant treatment, however; because of the few trials which have small patient samples and with unselected patients more studies are still needed. Regarding afatinib a meta-analysis presented data where this drug could be considered as more toxic than erlotinib and gefitinib. There are no data regarding afatinib as neo-adjuvant treatment, however; regarding adjuvant treatment there is one study by Burtness B et al. , which has not investigated lung cancer, but head and neck cancer. Maybe this study could be used for further investigation of afatinib as adjuvant treatment for NSCLC. There is one group of patients that tyrosine kinase inhibitors are still under investigation whether they would benefit or not. The “elderly” if one could set the age for this group of patients it would probably be >75 years of age which is more or less recognized by the international medical community the cut off age that a patient should receive chemotherapy. Although in several patient cases an individualized approach is necessary if the patient has could performance status. The elderly are not considered could candidates for trials since they tend not to complete them due to side effects. EGFR; Epidermal Growth Factor, AKT; kinase-interacting protein1, PTEN; Phosphatidylinositol-3,4,5-trisphosphate 3-phosphatase, PI3K; Phosphatidylinositol-3-kinases, PI 3-kinases, PI(3)Ks, RAS; Ras superfamily of proteins, which are all related in 3D structure and regulate diverse cell behaviours, RAF; Raf kinases (more avidly C-Raf than B-Raf), MAPK/ERK; extracellular signal-regulated kinases , TKI; Tyrosine kinase inhibitor, STAT; Signal Transducers and Activators of Transcription. MEK; mitogen-activated protein kinase kinase enzymes MEK1 and/or MEK2. We performed an electronic article search through PubMed, Google Scholar, Medscape and Scopus databases, using combinations of the following keywords: tyrosine kinase inhobitors, erlotinib, gefitinib, afatinib, and combination of these words with the word elderly. All types of articles (randomised controlled trials, clinical observational cohort studies, review articles, case reports) were included. Selected references from identified articles were searched for further consideration indifferent of the language. determine the median, 1-year, and 2-year survival The most common toxicities were acneiform rash (79%) and diarrhea (69%). 43.6) and 3 months (CI 95%: 0.4-28.4), respectively. in elderly, chemonaive, Taiwanese patients with NSCLC. Possibly a new group of patients including >75 years of age could be considered in the treatment of lung cancer since targeted treatment with TKIs surpass the major obstacle of chemotherapy side effects. In the study by Costa GJ et al. patients were divided in two groups: a) <70 years of age and b) > 70 years of age. Platinum based chemotherapy was administered and the results indicated that “elderly patients” >70 years of age for the first two years of drug administration had the same side effects when compared to patients of <70 and treatment was well tolerated. Therefore it was proposed that “elderly patients” > 70 years of age could choose non-specific cytotoxic agents for treatment of NSCLC. In the study by Yellen SB. Et al. patients were divided into two groups: a) <65 years of age and b) > 65. It was observed that most patients in group b were willing to have chemotherapy treatment, however; when they were asked to choose between survival and quality of life, most of them chose quality of life. In all the studies included patients were harboring epidermal growth factor receptor (EGFR) mutations. In the study by Wheatley-Price P. et al. severe toxicity was observed in a number of patients and therefore dose modification was required. In the study by Bai H. et al. gastric bleeding was observed by the administration of both erlotinib and gefitinib. Erlotinib is known to cause gastric bleeding and it is dose dependent. A major issue that we identified during our search firstly is that there is no clear definition which patient is considered “elder”. In the U.S.A elderly were considered mostly patients >70, while in Europe >75 years of age. Secondly very few studies were designed especially with the purpose to identify whether TKIs should be definitely administered to the elderly. One of the reasons is that in general studies conducted with patients more than 70 years of age are difficult to recruit and maintain the follow up of the patients. Thirdly in a number of studies the first line treatment of choice was chemotherapy and the second line was a TKI. However; as previously presented the status of the EGFR changes after chemotherapy, therefore we need more studies without previously treated elderly. Moreover; there are no data concerning afatinib and the elderly patients. Afatinib is a very new drug in the market and current data indicate that is slightly more toxic than erlotinib and gefitinib. Based on the current information we suggest that TKIs should administered in the elderly, and with the word elderly we propose the age of 75. The treating medical doctor has to evaluate the performance status of a patient and decide the best treatment in several cases indifferent of the age. TKIs in most studies presented safety and efficiency and of course dose modification should be made when necessary. Comorbidities should be considered in any case especially in this group of patients and the treating physician should act accordingly.